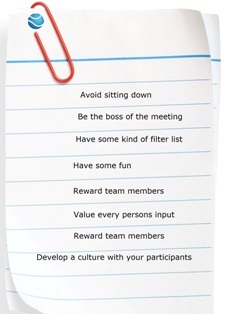 Meetings don’t have to be boring for achievement of set goals. The importance of formal meetings cannot be over emphasized and this implies that measures and methods of making them to be maximally productive must always be sought. They are to ensure that participants are actually willing to be part of the team due to the fact that they enjoy. Standing in meetings make people go straight to the point and avoid wasting time on unnecessary discussions because of the discomfort of having to stand long hours. It is also likely that contributions will be mentioned in details to prevent the possibility of revisiting what is already done. Walking is also very effective especially for the people who have difficulties facing others squarely which most of the time hinders their productivity. This method calls for some sort of measured control without being over bearing. It calls for the ability to act like a choir master where you are able to control the varying emotions and reactions of the different participants in the meeting. This ensures that all participants maintain their calm and keep tolerable levels of understanding. This is a sure way of enhancing understanding despite the fact that opinions could be conflicting. This is a sheet where you record all the upcoming suggestions and discussion items. This will ensure that you remain within the limits of the set agenda and not wander away and end up discussing non related issues thus achieving no goal. The listed important topics could be scheduled for the next meetings. Jokes are a great way to lighten peoples moods irrespective of how serious they are .meetings are usually intended for finding solutions and action plans. This does not mean that participants should not laugh for actually doing this could release tensions that come with the pressure of meetings and deadlines and should be encouraged. The achievement of solutions through meetings should not be taken for granted. Organize some kind of celebration for all participants to show your appreciation of their input and results. This will challenge them to perform better next time since they know they are recognized. This calls for understanding especially of the fact that people are differently and so is there response. Do not lock anyone out just because they take time to contribute. Instead encourage all people to chip in by making it a round table discussion and not one man based. Coming up with routines that must be done in the meeting goes a long way in fostering a sense of belonging. Thing like specific rules on time that is well known by every participant will increase the meetings effectiveness. You could come up with penalties for late comers to discourage the behavior.